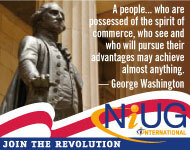 NiUG takes the concept of sharing and comparing to a whole new level in the city of brotherly love this year! Join us in Philadelphia, home of the Philly Cheesesteak of course, but more importantly, a city defined by innovative thinking and significant history. In creative settings, people are generally inspired to come together to create new ways of thinking - the Discovery Conference is the ideal place to network and more importantly, learn as a group how to overcome challenges and how to succeed. We have one full day of training to kick off the conference on over 10 different topics, the most we have EVER offered on the first day of our conference followed by two days of a users conference that dives into over 24 different topics and for the first time ever, a FIFTH session has been added to the consecutive session time slots to partake in, showing the various products you can get to integrate and enhance your existing iMIS functionality. Don't miss out on the time we give you over the course of the three days to meet and make everlasting connections with fellow iMIS users, NiUG staff, ASI staff and all of our solution provider and vendor members. If there is something you want to do... I am sure we have a solution for you! Register today! Who Will Be In Phildelphia? Good question! We have the simple answer - take a look for yourself! Check out our eSocial networking portal and browse through the attendee directory (sorry, only registered attendees please!). NiUG International chooses (c)onnect to link etouches and iMIS together to create the most powerful event platform in the world.